May I be honest with y’all? I like y’all, so I feel I can be honest. I have been super busy in the last few days looking for an apartment. I have finally found a spot I like and am now starting to pack. So, during the chaos, I have fallen back on the Mini-Maidens. Frankly, they are the only series I can scan and prep in just one night. I mean, I’d like to say I did this for purely artist reasons, but really it was a mental health decision. Plus, I printed out some images from the 1940s as source material weeks ago and I decided to get the darn paper doll set done. Anyway, today we have Hazel, one of the Mini-Maidens. She’ll be getting an early 1940s wardrobe. 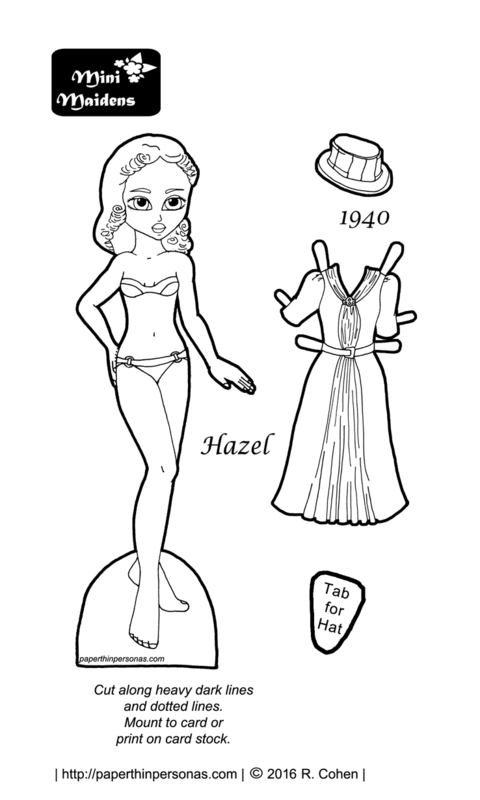 Because nothing says, stress relief like a 1940s fashion paper doll, am I right? Why the early 1940s? Because the styles changed dramatically after World War 2. I wanted to look at the fashions for the first part of the decade, except for one purse that slipped in accidentally. You can check it out come Thursday where there will be an Accessory Thursday post. I know that will make some of you happy. So, Hazel here has one dress for today. It’s based on this uncredited image from a magazine from 1940 that I found in the New York Public Library Digital Collections. I did my best on the hat, but I’ll openly confess that I am not totally pleased with how it came out. Still, you can’t please all the people all the time or even one artist most of the time. I struggle with hats, but I won’t get better if I don’t practice. Thoughts on the 1940s? Is it an era you like? Or hate? I find people seem to be pretty adamant about this decade one way or the other. Thanks to my recent discovery of Miss Fisher’s Murder Mysteries, I’m developing a big interest in 1920’s fashion. Essie Davis always looks fabulous. I’d love to see your take on that era, especially the hats 😉 and parasols. I have done some 1920s sets over the years (quite a few actaully). It’s one of my favorite eras. Here’s all the ones I’ve done so far: http://paperthinpersonas.com/tag/1920s/. My plan is to do more of them soon. I really want to do a 1920s children’s clothing set. Your hat looks fine. Reminds me of the ones in my 1940s paper doll set from some magazine of the era — found them at a thrift store. Too fragile to play with, which is a pity. Yeah, it’s an era I have mixed feelings about. Someday, I want to do some military uniforms from the period, but I am scared of not getting the details exactly right, so I keep putting it off. Well… I have mixed feelings about some of it. 🙂 However… That’s because I always see what’s wrong with my own work.